The more your AWANA car weighs, the faster it will go. Most rules specify a 5 oz. maximum weight. A car may need 3 oz or more of additional weight depending on how much wood is removed when you shape your car. Add as much weight as you can near the back of the car for fastest speeds. Our weights are available in a variety of shapes and metals. Each metal has its advantages and disadvantages. The following table will help you to decide which metal you would like to use. Cylinders are usually inserted in holes that have been drilled in your car. These weights are 1/4" diameter. Cut with wire cutters and other cutting tools. Drill one or more 9/32 " holes near the back of your awana car, insert the weights in the holes then glue them into place or cover with wood putty. Includes 3 sections for a total of 3 oz. 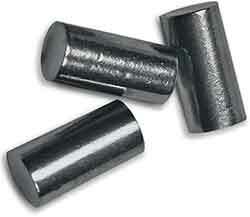 These are lead weights and should not be handled by children. Each cylinder weighs 1/10 oz and is 1/2" long. Diameter is 1/4". Includes ten cylinders for a total of 1 oz. The best way to install these weights is to drill 9/32" holes near the back of your car, insert the weights in the holes then glue them into place or cover with wood putty. 3/8" diameter cylinders. Four sizes to choose from. Same density as lead. Can be cut with a sharp knife. Each package comes with 3 rods for a total of 1 oz. To drill holes for Steel and Tungsten Cylinder Weights. Fits any 1/4" or larger drill. Four 3/8" diameter cylinders. 1/2 oz each. 3/8" drill bit required . Use super glue to attach our Flat Weights to the top or side of your awana car.The Tungsten Plate and Steel Bottom Weights are designed to be attached to the bottom of your car. Each plate is .5 oz . Dimension: 1.43" X .56" X .068". Mount on the bottom of your car or on any flat surface. Several plates can be mounted on most cars. This steel weight can be glued to the bottom of your car. It is less than 1/16" thick so it won't interfere with your car's bottom clearance. Break off segments in .02 oz increments to adjust your car's weight. Ideal for low-profile Awana cars with a flat or wedge body design. It is sleek and tapered for minimal wind drag. Ideal for "light" cars where you want the weight added to one area. Easy to use. Super glue to the top of the car or drill a 1 1/8" hole and glue it into the hole. For drilling holes for our Tungsten Disc. This smooth tungsten canopy has a 3/8" stud for mounting to your car. Drill a 1/4" deep 3/8" hole then super glue to your car. This tungsten triangle weight has a 1/2" stud for mounting to your car. Drill a 1/4" deep 1/2" hole then super glue to a flat surface on your car. This putty is great for fine-tuning the weight of your car. It can be easily molded into almost any shape. Pinch off a piece and press the putty into a hole in the car. This Tungsten bar weighs .84 oz and is 1/4” thick x 1/4” wide x 1 1/4” long. Can be installed behind the rear axle by cutting a slot in the bottom rear corner of the car..
We recommend our Super Glue for attaching weights to your car.